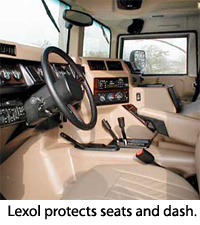 Lexol Total Kit includes complete leather and vinyl care by a trusted name in leather products. Complete leather and vinyl care by a name you know. Lexol-pH Leather Cleaner is balanced to match the pH of leather. This preserves the leather's strength, durability and appearance. The foaming action penetrates the pores of leather to lift and suspend dirt and oils. These contaminants are then easily rinsed away. Lexol-pH leaves no residue like soaps and will not contribute to fiber deterioration. Lexol-pH Leather Cleaner is the safer alternative to harsh, alkaline products like saddle soap. For further conditioning, use Lexol Neatsfoot Leather Dressing. It is as nourishing as raw neatsfoot but without the greasy side effects. Lexol Neatsfoot Dressing still maintains the look and feel of oil, but is buffered to a pH that is better for leather than raw neatsfoot. Lexol Neatsfoot Leather Dressing also contains a lanolin derivative that moisturizes leather and enhances the performance of the neatsfoot oil. Collagen and elastin proteins found naturally in leather are nourished, improving the flexibility and durability of the leather. Lexol Vinylex is a state of the art protectant that combines cleaning, protection and beautifying properties in an easy to use one-step product. It actually penetrates below the surface layer to restore the underlying plasticizers. Of the five patents that govern silicone protectants, Vinylex carries two of them. Lexol Vinylex will leave a clean, renewed surface without being too shiny and never oily. A tough towel by any standard! But the density of this cloth makes it so supple and completely non-abrasive, that it is safe to use on even the most delicate painted and plastic surfaces. This quality towel has over 200,000 strands of fiber per square inch. Regular use of the products in the Lexol Total Kit will renew and preserve your leather, vinyl, plastic, and rubber surfaces. It’s the total package! A total retail value of $55.93. Save $10.93!